Most dining experiences, no matter what the type of cuisine, give a small, Americanized sampling of the area which they are meant to represent. 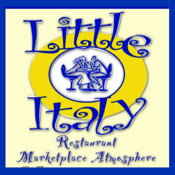 However, at Little Italy, Chef and owner Giovanni Sanzone and wife Sandy transport the customer in the form of Italian flavors and tastes, sounds, smells, and visuals. It really is the next best thing to being there.